Caropreso is 6-4 and looks to still be stretching out. He has good length and plays with a high motor, active and aggressive on the boards. Caropreso does a lot of his damage from 15 feet and in with a good mid-range pull but can also work the blocks well. The young wing out of Iowa has a solid overall game, and at 6-3 plays even longer than his height. On offense, he is a good slasher who takes the ball to the hoop well off the bounce and has shown the ability to shoot the ball well at different levels when he gets going. Cook has gradually transitioned himself from more of a low-post player to a more versatile wing/post who can stretch defenses some with an improved outside shot and the ability to break down bigger defenders from the perimeter. Cook has good length at 6-5 and protects the interior well with his shot blocking ability. Crowley is a heady interior player with a developing skill-set off the blocks. He can turn either way in the post to score around the basket and has shown capable of stepping away a bit and knocking down shots off the catch. At 6-6 he is long and rebounds the ball actively. Following in good footsteps, Finke is already 6-3 getting set to enter high school and is a hard-nosed player with a scoring mentality. Finke can knock down shots from three-point range, is excellent finishing plays in transition and can hit shots off the pull up. He goes at the glass hard and is improving his ability to get teammates in the mix with his passing. Fruin is a good-sized guard at 6-3 and his skill-set has developed well over the past year. Fruin is a confident shooter who can knock it down from the perimeter with good efficiency, but also can pull up off the dribble and hit mid-range shots. He also has good vision and gets teammates involved well. 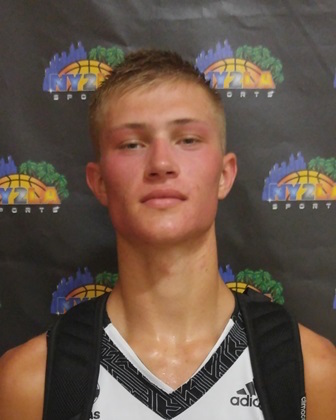 Hauser is a tough scoring wing with excellent size already. Stretching to about 6-5/6-6 already, Hauser can shoot the ball and is a good scorer when attacking the basket, but is really good hitting the offensive glass for tips and put backs. Loewe is a tough guard with good speed up the court on the break and outstanding instincts. He sees the floor really well with his size and IQ who makes smart decisions with the ball typically, but can also score it from different levels. His perimeter shooting is coming along nicely and he can also finish with either hand going to the hoop. McCaffery is an outstanding all-around player with great size (6-5) on the wing. McCaffery plays hard and has great instincts on the offensive end where he can beat opponents with a quick release and sharp-shooter accuracy when he gets a decent look. He drives baseline well from the wings and can finish through contact well. McKnight is a developing young post prospect who is improving his athleticism with his size. McKnight has good footwork inside and can turn either way in the post to score. About 6-5, McKnight has also shown he can step back and play from the elbows as well where he hunts his shot and can knock down the mid-range pull with confidence. Muench is a tough and quick guard with the ability to make plays in a variety of ways. The 6-0 guard has good handle, sees the floor well and is constantly on the attack looking to create for teammates, but also to find open looks he can pull up and bury. The young guard is a relentless player with a good overall skill-set. Negus can drill shots from different levels, having shown good consistency from the perimeter, but also the ability to penetrate and hit the mid-range. He shares the ball well off the attack and is a quick defender with good hands and instincts. Ruffin plays similar to his older brother with a good blend of skills both from the wing as well as being able to get to the paint and score with the pull up or craft his way to the hoop and finish around the basket. Ruffin rebounds the ball well and is active defensively, but his offensive game is wear he hangs his hat right now. Schmidt has a good blend of skill and toughness incorporated into his game along with decent size. At 6-2, Schmidt has showcased the ability to drain shots from the perimeter and is a consistent mid-range jump shooter. The young guard is good in transition and plays hard on both ends of the floor, including getting at the glass. The 6-4 forward is molding his game still, improving his versatility shooting the ball away from the hoop and being able to break down defenders with his dribble. Right now, Seefeld is really solid around the hoop, finishing with good touch with either hand and has showed he can play through contact. He rebounds tough and uses his length well, but is not afraid to be physical in the middle when necessary. A long big interior talent with excellent upside and potential. Joseph has solid instincts, can finish around the basket, he has a nice strong frame, and he’s shown the ability to be a dominant force on both ends of the floor. The young interior standout is a strong Division 1 talent to pay close attention to. The 6-2 guard is a workhorse defensively, using his quickness and ability to read plays to get deflections and steals, but also goes hard rebounding the ball. On offense, Steffen is elevating his game well as he is able to stretch defenses some with a developing three-point shot and the ability to get to the rack off the dribble and finish. Vander Plas had a big freshman season up on varsity and has really crafted his overall game well. The 6-5 forward is able to play inside and outside with good skill and agility from the blocks, but impressed throughout the year with his ability to knock down shots with good range from beyond the arc. He rebounds aggressively and is active up and down the court. Volbrecht is a long and developing forward with good skill around the hoop. With his 6-7 size and frame, Volbrecht is intriguing prospect to watch as he continues improving his overall skill set. He is solid rebounding the basketball and uses his length with to disrupt defensively. Weckerly is a defensive-minded post prospect who uses his build and his 6-7 length with to deter smaller opponents from contesting him going to the basket, and then he goes after the boards with good aggression. Offensively, he is strong inside and finishes well around the basket.